Tonight my "book" (design portfolio) was due. I have been working towards this for a long time now so it feels unreal that I have my portfolio, a resume, a website, a logobook. I guess all I need is a job. A lot of my class waited while our professor went over our books and we were talking about what kind of work we wanted to do. It was all different but similar. When people ask me what kind of job I want, I feel hesitant to say because my favorite thing is to illustrate but I have been told that things like layout out brochures and annual reports are where the money is. So does a person apply for that sort of job or freelance doing things you really like? That is the question. There is a group of us from school who are talking about starting our own design firm which sounds like the best of all worlds. We are all good designers and have different skill sets and we like one another and have lots of fun together. In the middle of getting the portfolio ready, the website up, reading "Painless Algebra" so I can pass my algebra final, I did something just for fun. 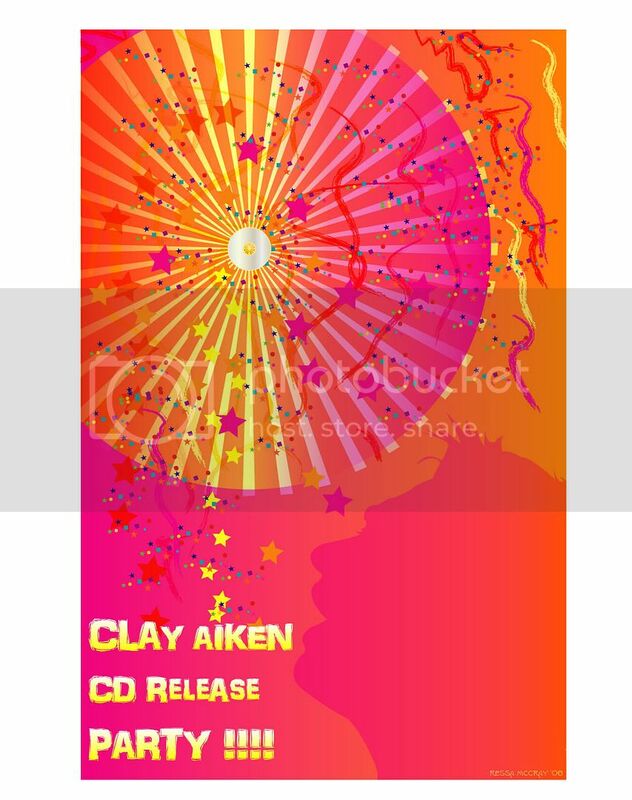 We will be having CD Release Parties when Clay Aiken's new album is released and there will be a poster contest at some point. There have been some less than happy times lately so I wanted something bright and festive. It gets bigger if you click it, but put shades on first! Love your poster. Go for it. This will surely attract attention which I bekieve is what the cd release parties are all about. I am enjoying your blog, especially since I know very little about design. That's a cool poster. I wish I had some artistic talent!